President Donald Trump assailed House Speaker Nancy Pelosi on Sunday for rejecting what he is calling a compromise to end the record 30-day partial government shutdown, with $5.7 billion for his barrier along the U.S.-Mexican border and three years of protection against deportation for hundreds of thousands of immigrants. Nancy Pelosi and some of the Democrats turned down my offer yesterday before I even got up to speak. They don’t see crime & drugs, they only see 2020 – which they are not going to win. Best economy! They should do the right thing for the Country & allow people to go back to work. Trump, now halfway through his four-year White House term, offered his plan to end the longest government closure in American history in a speech Saturday. But Pelosi, leader of the Democratic majority in the House of Representatives, called it a “non-starter” before Trump spoke. Republican Senate Majority Leader Mitch McConnell said he plans to bring Trump’s proposal to a vote in his chamber in the coming days, although he will need some Democratic support to win approval. Trump defended his call to offer deportation protection to 740,000 immigrants who came to the United States illegally as children and thousands more from Latin America and African nations who have been living in the U.S. temporarily but are facing orders to return home. Pence said Trump “set the table for a deal. The president is offering a solution, the Democrats just sound bites” in television interviews. Democrats have demanded that Trump reopen the government and then negotiate border security provisions, while rejecting a wall as ineffective and immoral. They are offering $1.3 billion in new border security funding, but none specifically for a wall. House Democrats plan to offer more border security legislative proposals this week. Republicans hold a 53-47 majority in the Senate, but major legislation in the chamber almost always requires a 60-vote majority. It is unclear if Trump will be able to convince at least seven Democrats to vote for his proposal. Even if the Senate approves Trump’s plan, it would face defeat in the House, where Pelosi-led opposition runs strong. A Senate victory for Trump, however, could force new negotiations over his border wall plan and over reopening the government, where 800,000 federal workers, furloughed or forced to work without being paid, are set to miss their second paycheck next Friday. 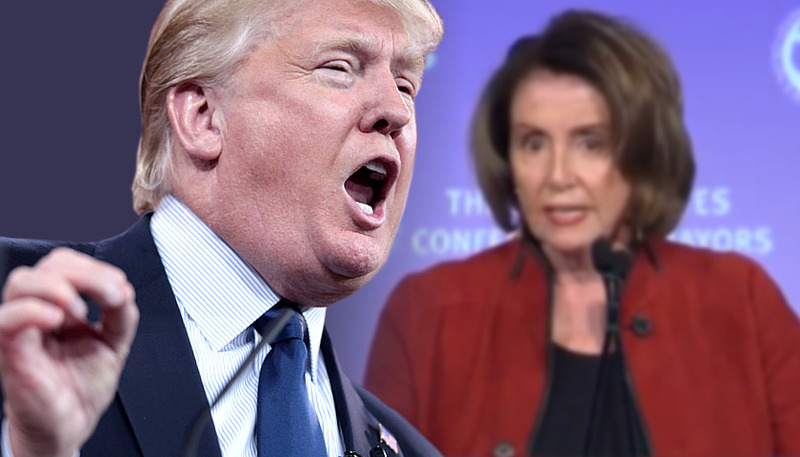 Trump tweeted, “Nancy Pelosi has behaved so irrationally & has gone so far to the left that she has now officially become a Radical Democrat. She is so petrified of the ‘lefties’ in her party that she has lost control…And by the way, clean up the streets in San Francisco, they are disgusting!” The California city is Pelosi’s home town. As tensions over the border wall and the government shutdown continued unabated last week, Pelosi demanded that Trump postpone his scheduled Jan. 29 State of the Union address before a joint session of Congress until after the government is reopened, submit it in writing to Congress or make the speech at the White House. Trump, in turn, postponed her fact-finding trip with other congressional leaders to visit U.S. troops in Afghanistan. Trump had not directly responded to her call to delay the State of the Union speech till after the shutdown ends.